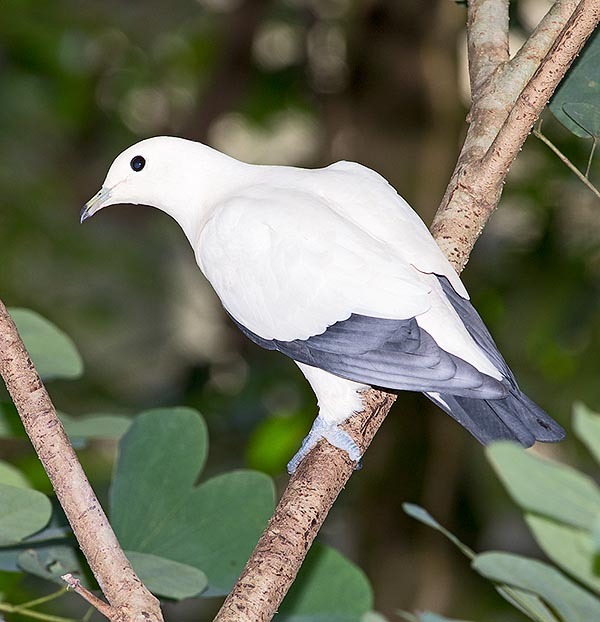 The Pied imperial pigeon (Ducula bicolor Scopoli, 1786) belongs to the order of the Columbiformes and to the family of the Columbidae and until some years ago was considered the progenitor of some subspecies later on revaluated to level of species. Still now the debate about these new classifications creates rather discordant opinions among themselves, seen the remarkable similarity of the species, the dimensions, the colours and in some instances the overlapping of the inhabited areas, however we prefer to follow this new line and consider the Ducula luctuosa, the Ducula spilorrhoa and the Ducula subflavescens as three new species, detaching them from the Ducula bicolor. As a result of this new subdivision its range has been partially reduced for the benefit of the new species even if maintaining a primary position in the presence and in the entity of its populations. This pigeon is quite common and present in its natural territory but during the decades has also become one of the most bred and kept in the zoos birds of the world thanks to its elegance and beauty as well as to the facility of keeping. Furthermore, it is an appreciated pigeon due to its particular composure that renders it haughty and in the same time refined and that has deserved it that royal name so much important that they have scientifically given to it. The scientific name Ducula has Latin origin and comes from “dux-ducis” = chief, hence duce, duke, ducula that has then led to the common name of imperial given in Italian as well as in the Anglo-Saxon world. The genus bicolor comes always from Latin to remind us that its livery is formed by only two colours, the white and the black. Other vulgar names are: in English Pied imperial pigeon; in German Zweifarben-Fruchttaube; in Spanish Dúcula Bicolor, in French Carpophage blanc, in Portuguese Pombo-imperial-bicolor and in Italian Colombo imperiale bianconero. The original area of this purely Asian pigeon includes the islands of the Bay of Bengal, Andamans and Nicobars, through Indonesia and the Indochinese peninsula, up to the Philippines and the New Guinea. Besides the three aforementioned species, in these areas have been classified other subspecies linked to some island of the Maluku but the matter is still under discussion and it is thought that probably others may be in the future reclassified in turn. The populations of the Bismarck Islands, of the Aru Islands, part of New Guinea and the southern area of the Indonesian archipelago including the northern coasts of Australia previously concerning the Ducula bicolor, are now considered as territories assigned to other species. 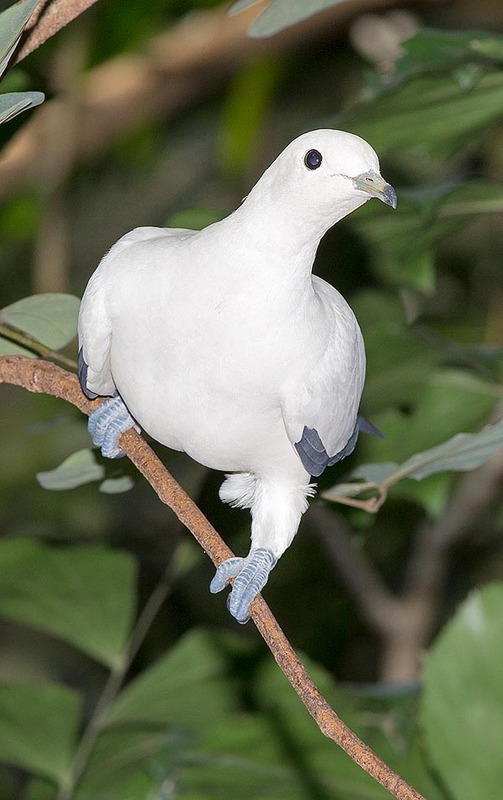 This pigeon lives in dense evergreen coastal forests, mangroves woods, dotted by tall trees where it often takes shelter to then get down in the underlying frugiferous ones when necessity arises. It loves to stay among the leaves where it easily goes unnoticed albeit the candid white of its mantle and even only its curious and rapid movement of the neck while peeking what is passing under, may at times evidence its presence. It is not a shy bird but loves the privacy as typical to the columbids living in the forests. It also often frequents cultivations of coconut trees, of oil palms and of various essences of spices among which the wild nutmegs and perfumed berries of which is particularly greedy. In the cities and in the parks it is often seen hanging on the tufts of wild dates or seeds of other palms while looking meticulously for ripe berries. As happens for all the frugivorous birds its type of feeding is by sure a means for the dissemination of the seeds of the plants it nourishes of. As its scientific name states as well as some vulgar names, the colours of the livery of this pigeon are mainly the white and the black. The body is totally milky white with remiges and the final tip of the tail of a nice intense black colour. When flying this contrast is clearly visible even from far away but is difficult to distinguish from its previous conspecifics. Particularly, due to the fact that the other cited duculas, show only one black streak under the tail that is visible only when near. Our pigeon is 40 cm long, may reach 500 g of weight and a wingspan of more than 45 cm. The bill is greyish black unlike the Torresian imperial pigeon (Ducula spilorrhoa) that has it yellow. The young have a livery much less contrasting and much more subdued colours. 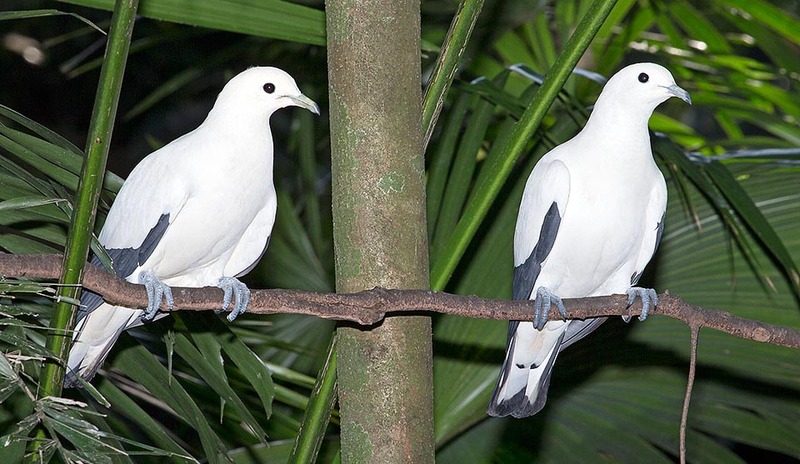 The pied imperial pigeon nests usually during the year-end months even if often we observe sporadic nidifications in other periods. The nest is a light and weak platform of twigs placed on branches at not elevated heights where are laid one or two white eggs. The nest is so weak that often we can take a glimpse from below of the contents of the nest. However, it is sufficiently resistant to brilliantly overcome the task of which it is in charge. It does not nidify in colonies but several couples may nidify in very close zones. Conversely, it is often found in numerous groups during the research of food in particular when they gather on the same trees during the ripening of the fruits. The parents are much caring and rarely the partners leave the nest unwatched whether it contains eggs or nestlings. The hatching lasts 17/19 days and is done by both sexes. The chicks, that come to life featherless, remain in the nest for 5 weeks more, cared by both sexes, initially fed with the typical pigeon milk, a very nutritious predigested mush, and then after a short time they pass directly to seeds and fruits. It has no particular foes but the usual hawks and some eagles but also the men in some rural areas hunt it for its excellent meat. It is not an endangered species and have not been noted remarkable reductions in the populations as the territory it is losing in the forests is gradually earned getting closer to the inhabited centers.